This video encapsulates all of the action at the Awards Dinners in 1993 and 1994. Includes speeches by Jon Jon Park and Steve Reeves. 1993 Reg Park and 1994 STEVE REEVES. 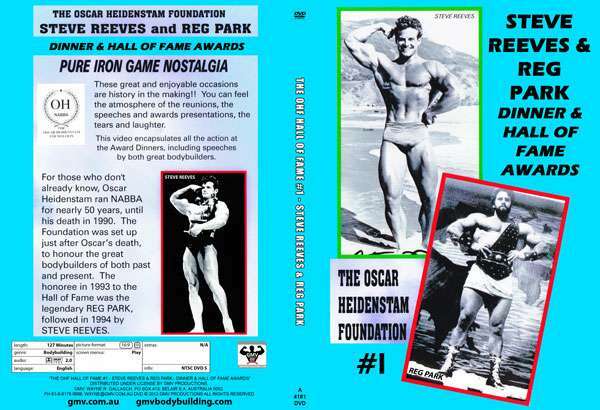 THE OSCAR HEIDENSTAM FOUNDATION HALL OF FAME AWARDS – MAKING HISTORY & RECORDING HISTORY – NOW STORED ON 14 FANTASTIC DVDs. WATCH & ENJOY THE MAGICAL & WORLD FAMOUS OHF ANNUAL DINNER & HALL OF FAME AWARDS. The Awards footage also features interviews with many well-known personalities. Enjoy the wonderful speeches, the laughter and tears, and the emotional presentations of the various awards. Since 1998, the DVDs have been narrated throughout. This includes who’s who in the audience, hand balancing acts, agility, and the amazing strength attempts by various guests. See attempts made at lifting awesome items including the unique Super Nova 186 lbs kettlebell, the 226 lbs Millennium dumbell and the world famous 172 lbs Thomas Inch dumbbell, and its replica, breaking 6 inch nails, rolling up frying pans, and much more – Wow! For those who do not already know, Oscar Heidenstam ran NABBA for around 50 years, until his death on 21st March, 1991. He was born in Cyprus on 27 February 1911. The OH Memorial Trust was inaugurated by Malcolm Whyatt in March, 1991, in memory of Oscar and to honour the great bodybuilders past and present. In October 1994 the name of The Oscar Heidenstam Memorial Trust was changed to The Oscar Heidenstam Foundation. DVD #1 IS A COMBINED DVD of the 1993 & 1994 HALL of FAME DINNERS. 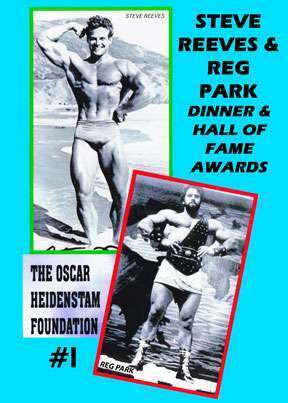 1993 REG PARK 2nd Annual OHF Dinner & Hall of Fame Awards. This DVD encapsulates all of the action at these 2 Awards Dinners, including speeches by both of these legendary bodybuilders. Over 200 guests attended to honour REG PARK, and included: Jon Jon Park, Johnny Isaacs, Spencer Churchill, John Grimek, Reub Martin, Ted Aston, Filippo Massaroni and many champions of Italy. Hall of Fame speeches in respect of Reg Park by Ivan Dunbar, Chairman of NABBA, followed by Jon Jon Park and Mr Ian MacQueen, OHF President. Speech by REG PARK, the 1993 OHF Hall of Fame guest of honour. 1994 STEVE REEVES 3rd Annual OHF Dinner & Hall of Fame Awards. A large number of guests, making it a sell-out crowd, attended the 1994 awards to honour STEVE REEVES. Hall of Fame speech in respect of Steve Reeves by Malcolm Whyatt. The speech in respect of Bert Loveday was made by Dr. Tom Temperley, OBE, OHF Vice President. The event Compere was Colin Norris. Speech by STEVE REEVES, the 1994 OHF Hall of Fame guest of honour. Services to the OHF: Dr Ken Leo Rosa – U.S.A.
A Special Services to the OHF award was also given to Ivan Dunbar, Chairman of NABBA. As Ivan was away overseas, the presentation was made to him in the October at the 1994 NABBA Universe. The DVD contains ALL of the presentations, highlights of the Grand Draw and Silent Auctions, views of the OHF memorabilia, and scenes of the enjoyable socialising in 1993 and 1994. This is DVD #1 of a series of 14 OHF DVDs. These DVDs, taped near London, are pure Iron Game nostalgia.